The first time I ever heard of a lapbook was on a Five in a Row Yahoo group, so I had not actually seen one in person. When I had the opportunity to attend a seminar by Tami Duby of Tobin’s Lab on how to create lapbooks, I was first in line. Lapbooks are paper manipulatives using file folders in which the student stores creative summaries of their work. 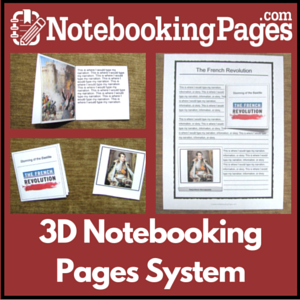 The concept is similar to notebooking and some notebooking resources can be used in lapbooks, but the concepts do differ. Lapbooks are more than just notebooks with collections of worksheets, they are diagrams, minute books, and other paper manipulatives customized to emphasize the subject of the lapbook. Originally designed using paper manipulatives taught by Dinah Zike, author of Big Book of Books and the Big Book of Projects (affiliate links), lap books have been fine tuned and explained in depth by Tami Duby in her book The Ultimate Lap Book Handbook (affiliate link). I had the pleasure of seeing the lapbooks that Tami’s children have created from preschool to high school and they are impressive and varied. Lapbooks give a child something tangible to show friends and family and every time they show them off, they are reviewing the material that they learned in that unit or topic. Dinah Zike’s science unit studies and Eagle’s Wings curriculum (Considering God’s Creation, God’s Amazing Acts, and others) are excellent worksheets to use in lapbooks, as are the many notebooking forms found on the Highland Heritage website. Homeschool Helper Lapbooks – From Money to Chemistry, you will find a variety of lapbooks with downloadable pages at Homeschool Helper. Tina’s Dynamic Homeschool Plus – Information about lapbooking, notebooking and unit studies and is designed for the middle or high school homeschooler. There are also a number of resources for the elementary age homeschooler. WorksheetWorks.com – This very cool worksheet website is still in Beta development but I had no problems with it and am impressed with not only the range of worksheets but the ability to select difficulty level for creation and instant download. In addition to the instantly generated downloads, there is a collection of graphic organizers under Miscellanea that are not only useful for thought organization, but would work very well for notebooking and lapbooking. Lapbooking 101 – This blog has a wealth of resources for lapbooking.